Except, perhaps, for haggis, traditional Scottish food will be comfortingly familiar to Americans of Scottish descent because so many Scottish recipes have been adapted or transformed into common American fare - consider a hearty barley-vegetable soup (Scotch broth), pot pies (Scotch pies), or what our family calls hamburger hash (stovied tatties, to the Scots). Being none too rich and careful of their resources, Scots cooking relies on basic ingredients cooked up to warm the innards and provide strength and energy - what we consider a good "meat and potatoes" diet (though often easy on the meat). While the lowlanders relied on mutton (and sheep innards are the basis of haggis, a sort of sausage made with sheep offal and oatmeal), the Highlanders always preferred beef and running cattle (and appropriating other clans' cattle) was their way of life. To them we owe the succulent pleasure of Angus beef. Interestingly, the Scots do not care for pork (the Highlanders despised pigs), even though their Irish ancestors were big pork eaters, so you won't find pork mentioned much in Scottish cookbooks. Living in a land of isles, lochs and burns, fish and seafood have been Scottish staples from time immemorial - if you want to know what to do with salmon, crab, scallops, and all the rest, the Scots can tell you. The Scottish people have a strong sweet tooth (as do most Americans) and are famed for shortbread, scones, and other wonderful treats, many relying on honey (heather honey) and berries for their sweet flavor. The "Black Bun" is an extremely rich fruit cake named for its dark color. Vegetables grown and eaten in Scotland include potatoes, turnips, carrots, cabbage, peas and cauliflower -- all suitable for their climate. Fruits are mostly berries - raspberries, strawberries, blackberries, currants, and more. Wheat flour is used now, of course, but the traditional oatmeal and barley are still basic to most Scots recipes (and barley is the necessary ingredient for the beverage of choice!). Bannocks are traditional oat and barley cakes baked on a griddle. The Scots make and eat a lot of cheese, particularly a soft white cheese called "crowdie" that sounds similar to cottage cheese. Scottish cooking, with its emphasis on delicious, easy-to-prepare, and economical meals, is not only fun for the cook, but a sure-fire family pleaser. Additionally, the extensive use of fish, seafood, oatmeal and fresh fruit and vegetables make it healthy as well. The Scots use broth, much more than fat, to simmer food -- the word "fried" occurs rarely. Scottish-Americans can easily incorporate Scottish cooking into their family lifestyles and pass it along to future generations. Short and sweet. Mouth-watering Scottish baking recipes, easy to prepare. Clarissa Dickson Wright was co-host of the popular Scottish"Two Fat Ladies" cooking show. This cookbook won't teach you to make haggis, but will amuse you. Five stars. Just looking at fish and vegies makes us feel healthy and virtuous, but the sweets recipes are in this cookbook, too. The recipes seems more in line with the first part of the title than with the second - including one for Baileys Irish Creme. Lovely cookbook from Lady Claire MacDonald, prolific Scots food author. Lady Claire takes us on a journey to the best eating establishments in the Highlands and Islands, interviewing chefs and sharing menus and recipes. Spectacular photos of the scenery as well as the food. An Orkney barley miller, an Isle of Mull cheese producer, a Dundee sausage-maker, and a Brora jam-maker are just a few of the many Scottish food heroes Sue Lawrence meets along the way during her food tour of Scotland. 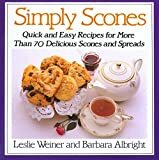 Many rave reviews for this cookbook - great scone recipes that work! It's amazing how many wonderful things the Scots invented. Sue Lawrence has collected 120 of the best recipes from her native land. With engaging stories about the origins of each dish, and Lawrences own memories of the tastes and flavors of her Scottish upbringing, each recipe highlights methods and traditions that have been handed down through generations.